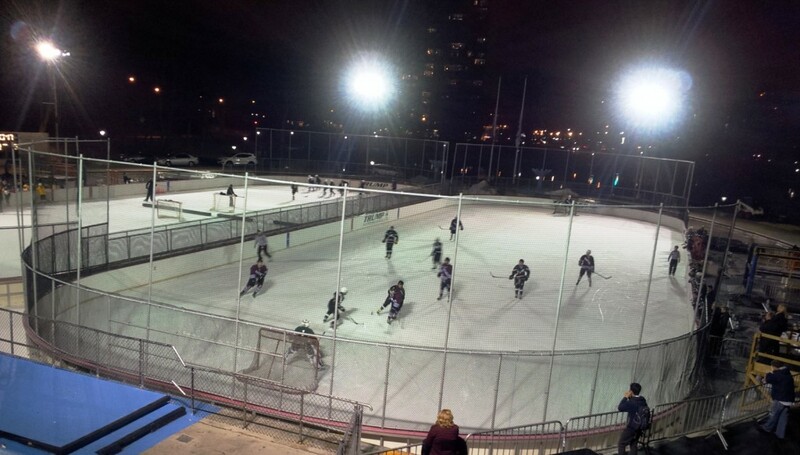 Xavier vs. Birch Wathen Lenox at Lasker Rink. I haven’t been to a high school hockey game yet this season. Shame on me. I’ve been following along avidly on Twitter, but the commute from the city to Jersey and back for a game has been too much for me to undertake, especially with my need to care for a very attached beagle. But I keep an eye on hockey in New York as well, and today I noticed a game with a manageable commute. So I took my beagle and headed out for a very extended late-afternoon walk, winding our way to Lasker Rink on the north edge of Central Park. There I took in the second half of a game between Xavier High School, located on 16th Street, and the Birch Wathen Lenox School, located on 77th. I’m very familiar with Xavier and its reputation, because the Knights play their home games in Bayonne and play the most extensive non-league schedule of any New York team. For league play, Xavier is in the B Division of the CHSHL (Catholic league), a division in which I think Hudson Catholic should be playing. Teams from the A Division include St. Anthony’s, Holy Cross, Iona Prep, and Monsignor Farrell, all of whom we have seen take on New Jersey teams. These teams rarely top 20 regular-season games, but last year Xavier played 25 varsity games, splitting with Hudson Catholic, and added two non-varsity contests against Oratory Prep. This year, Xavier will face Bayonne on Jan. 24. It seems like they’ll play just about anyone, anywhere. Birch Wathen Lenox, on the other hand, seems to be a program still in its infancy, and scores for its games against other smaller programs like Poly Prep and Fieldston can be hard to come by. I was not expecting much from them. 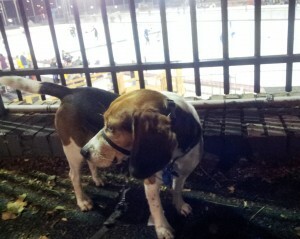 I found my way to Lasker Rink kind of by accident. It’s located just south of the main duck pond on the park’s north edge, and there are two adjacent rinks inside a large amphitheater that is used as a swimming pool in the summer. It’s a very unique setup, to say the least. 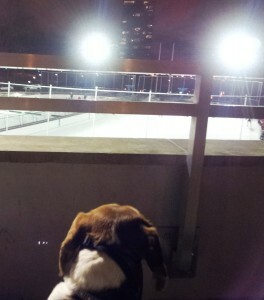 Unfortunately, rink regulations prohibit pets, so my dog and I were relegated to watching from a balcony of sorts and peering through bars. There was not much of a turnout in the way of fans – a few parents and siblings limited by rule to one corner, and for every goal or penalty the referee would skate to that corner and call out the information to the scorekeeper, who sat back near the snack bar where the input for the scoreboard was. After the game, the players traipsed through the same matted area on their way to the locker rooms. I was really curious to see how the zamboni got between the two rinks, and I wasn’t disappointed. After the game, the zamboni rolled around on one level of the amphitheater and backed its way onto a lift, which lowered to ice level and allowed the zamboni to back onto the ice. I knew there were zamboni elevators, but I don’t think I’ve ever seen one quite like this. On the ice, the action was about what you’d expect, which is to say earnest and dedicated but not particularly advanced. Xavier was up 5-0 when I arrived and breezed to an 8-1 win. But at least I’ve seen a game this year! The Knights are 4-1 overall (for a competitive reference they lost 3-2 to Monsignor Farrell, who in turn lost 10-0 to St. Peter’s Prep) and 2-0 in league play – they face Fieldston in a non-league game on Monday and Mt. St. Michael / St. Raymond Boys in CHSHL B play next Wednesday, both at Bayonne. 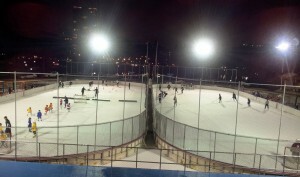 Birch Wathen Lenox, if its online schedule is accurate, will host Columbia Prep – another program of limited means – on Dec. 17, also at Lasker Rink. Given the view she gets, my dog does not plan to attend.